Accommodation for wheelchair and disabled access in Tuscany: this section offers a list of accommodation in Tuscany with facilitated access for anyone traveling with mobility impaired family members, whether it be with wheelchairs or not. 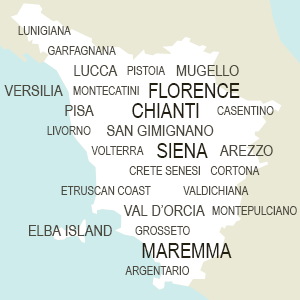 All the lodgings listed below, in fact, have rooms or apartments with bathrooms that provide extra space and auxiliary handles to welcome mobility impaired visitors to Tuscany: not only hotels and B&Bs, but farmhouses and holiday homes as well that wish to make all of their guests comfortably enjoy the flavor of Tuscany! Luxury accommodation in Greve in Chianti. Set in a Renaissance villa, probably birthplace of famous Mona Lisa, is one of the oldest wine estates in Chianti. It offers great facilities as spa center, tennis-court, pool, wine tastings and cooking courses. Accommodation de charme near Radda in Chianti. Set in a 18th century country villa, it features a garden with swimming pool and a panoramic terrace. Rooms are nicely furnished and equipped with modern amenities. Set in the beautiful Tuscan countryside near Riparbella just 5 km from the sea, this new resort offers both rooms and apartments, indoor and outdoor swimming pools, as well as wellness and business center. Welcoming self catering apartments with private parking, garden and a terrace overlooking the wonderful panorama that surround the suggestive town of Fiesole, close to Florence city center. This 4 star hotel near Lucca offers the best comforts for your stay in Tuscany, both for business and leisure. It has free Wi-Fi Internet connection, large business center and gym and sauna. This 4 stars hotel and resort is a 19th century hunting lodge located within 10 minutes driving distance from Lucca city center. It offers many different services and amenities for its guests. Strategically located near Florence train station, Hotel Diplomat offers fully equipped modern rooms. Modern 3 star hotel few steps from Santa Maria Novella station. The Duomo is a 10 minutes walk, as well as the Uffizi. The multilingual staff is on disposal. It offers apartments with kitchenette and apartments with all comforts. Luxury country hotel set in the surroundings of Cortona. It includes a lovely spa, outdoor and indoor pools, free parking and Tuscan restaurant. Rooms are large and equipped with modern comforts. Rustic hotel surrounded by green hills on the ancient Via Francigena to Rome, it is located near the medieval town of San Gimignano. This Grand Hotel in Viareggio, capital of the Versilia region, offers elegant rooms, swimming pool and wellness center. This fabulous villa is set in a wonderful location, surrounded by a wide panoramic park offering breathtaking views. It has both rooms and fully equipped apartments, furnished in the classic, antique style, but provided with all modern comforts. 4 star Hotel Hambros is located near Lucca and is set in an 18th century villa surrounded by a large park. It offers free parking and comfortable rooms equipped with major comforts. Greatly located 10 minutes walking from Pisa Leaning Tower the 2 star hotel offers simply furnished rooms with air-conditioning and free Wi-Fi connection. The hotel is surrounded by a relaxing garden. 4 star hotel in the center of Montecatini Terme. It offers spacious rooms with air-conditioning. The hotel has a nice outdoor pool, a large terrace and a restaurant specialized in Tuscan cuisine. If your mobility is impaired and you'll be spending a holiday in Tuscany, browse our list of accommodation with disabled access to find the best place that suits your expectations! All rental properties listed here are wheelchair friendly: you may choose among a wide and quality selection of both rural or city accommodations that will make your stay comfortable and enjoyable. Wherever you want to go, you’ll find lodgings with disabled facilities: farmhouses and villas in the heart of Chianti should you be interested in a food and wine tour, or hotels and B&Bs on the Tuscan coast if you prefer the seaside. If you’re most interested in visiting the old city centers, there’s a varied choice of cozy and comfortable accommodation in the top tourist destinations in Tuscany, including Florence and Siena. That said, there’s nothing left to add but to wish you a truly enjoyable Tuscan holiday!